Many of these fires are still under investigation even though most of them started long after construction workers were home in bed between 1am and 3am. The list of fires increases to 30 projects destroyed in the last year or so. "I am very grateful this didn't happen before they had people move in". Peter Sugg works across the street from the massive fire happened. He works as a computer software developer. Sugg tells CBS 42 he and his co-workers cannot believe this happened. "We walk by this building everyday on the way to lunch and its gone now so that's about strange now to see a big empty lot. The sheer amount of damage is strange as well". The two alarm fire started just before one o'clock Thursday morning. The four story apartment complex was still under construction but was 80 percent complete. Fire Marshal Tom White says because there were no doors,windows, or sheetrock in the building the flames spread quickly. The fire also destroyed a law office next door. "We are going to get into the investigation part of this to find an origin and cause. To see if we can find where the fire started. we know its a total burn down but we want to make sure we eliminate all the ignition sources and we want we want to get to the root of the fire what caused it" White said. Thursday afternoon many area residents and those who work in the area like Peter Sugg stopped by the scene to take pictures and want to know how this happened. "I knew that it was being built for a long time. Maybe two years or so, its kind of sad to see all this progress to be left in ruins and smoldering ash you know". One firefighter broke his leg and two ankles, he is being treated at UAB. A fire truck also sustained damages due to the heat of the fire. The case is under investigation, authorities have not found out what caused the building to burn to the ground. M-Fire Suppression Inc. is now getting the attention from the largest Insurance Brokers like the Lockton Company. 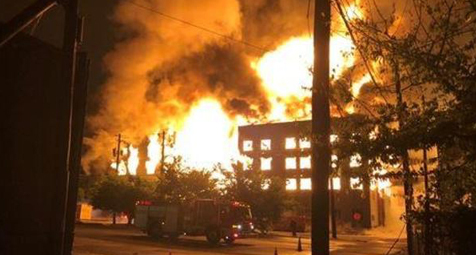 The Lockton Company recently released a White Paper about how to defend these buildings from fire to help builders lower the risk premiums. When will big media, like 60 Minutes, decide to cover this Urban Housing Crisis?